It seemed like every headline wrote itself when the news broke that Poltergeist was getting remade: “It’s Baaack,” “They’re Heeere,” and so forth. And now Tobe Hooper and Steven Spielberg’s 1982 haunted-house movie is finally here, and so bland and lazily imitative that most people would probably rather fight a clown doll than sit though the whole thing. It’s no surprise that the past several years have seen a myriad of horror-film remakes and reboots. Aside from a few indie successes, derivative possession flicks, and what feels like an endless stream of Paranormal Activity entries, the landscape of contemporary American horror seems to be stuck in a limbo of remade classics and revived franchises, from The Omen to Nightmare On Elm Street, and now Poltergeist. It seems no matter the era or the success of the original film, studios are moved to repackage any familiar horror title, with lukewarm results. And once these films leave theaters, they’re rarely spoken of again. Of course there are reasons studios would want to remake classic horror films. There’s the sheer weight of the name of a movie itself, and the legacy of specific franchises that allow for more updates and editions, from Hellraiser to Halloween. For some films, there’s the opportunity to update the special effects with new technologies. Foreign films like Ju-On: The Grudge and Let The Right One In get remade into English-language versions Stateside. And a successful horror-film remake can perhaps bank on bringing in the older audiences who loved the original, alongside younger audiences who haven’t seen the old one yet. But there’s a certain misguidedness that comes with remaking classic horror films, one that fails to recognize exactly why these films were so terrifying in the first place. In reshooting a horror movie, filmmakers virtually always lose the heart of what made the original successful: its aesthetic. Horror is built on aesthetics: the combination of cinematography, editing, and effects that build terror. Well-executed horror is the reason films can make viewers suddenly afraid of a top hat hanging in the corner of a room, the static on a TV screen, or a distant person walking slowly toward the camera. It’s not so much what horror is trying to tell, as how it’s trying to tell it. And horror movies in which the actual scares hinge on the film’s aesthetic properties simply can’t be translated into new movies, because so many of the originals were iconic for their newness, for their advancements in constructing terrifying visuals. Scenes like Tina’s iconic blood-soaked death and the other surrealist, dream-logic-imbued action sequences in A Nightmare On Elm Street just don’t pack the same punch in the dimly lit 2010 remake. Horror as a genre so often thrives in moving forward, in figuring out what makes people tick and jump in the present, in creating new characters or establishing smart takes on centuries-old ones. So remakes, especially ones that reach back only a couple of decades, seem antithetic to the genre’s relentless progression. 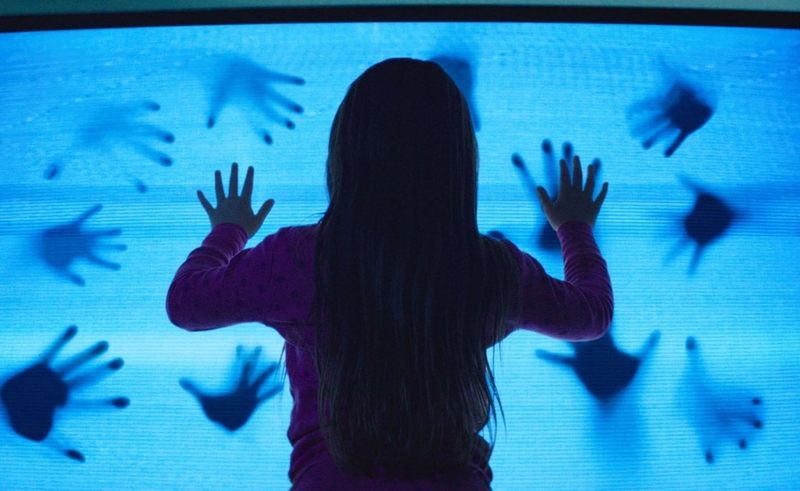 But while the 2015 Poltergeist remake suffers from a variety of problems, its primary issue is the way it doesn’t develop or maintain a compelling, unique look. The film itself looks cheaply made, and Gil Kenan’s direction is downright boring in the context of the genre. Even the way the home itself is constructed feels like a threat to the film’s narrative. It lacks the central congregating space of the original living room, which served as a stage for the second half of the film’s drama. It must be rare to watch a remake of a film and actually miss a staircase from the original. But the genericness gives the 2015 Poltergeist an uninspired, made-for-TV feel, which is only intensified by the film’s disastrous special effects. The 1982 Poltergeist made its ghosts compelling by summoning them up in so many forms, including incredibly minimalist ones. They ranged from orbs of lens-flare-heavy bright light to an invisible thug flipping JoBeth Williams around a rotating room. 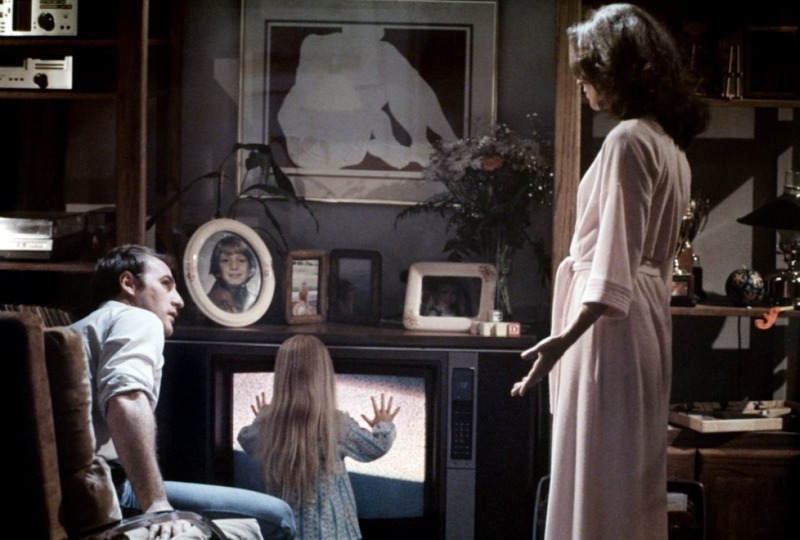 Even the ways in which the 1982 film used blinding bright light and the shadows of the family against the looming TV screen was enough to establish an effective, stylish boundary between the real world and the spiritual one. But although the remake keeps in some key scenes (scary tree! scary clown! ), nearly every poltergeist is represented with a boring skeleton. And all the effects are done in CGI, which flattens the realism considerably. Arguably, the greatest threat to horror originals is the temptation to update the special effects and cinematography to slicker contemporary norms. While what’s scary is subjective for every viewer, the physical and technical realizations of horror in film often balance on a fine line between terrifying success and complete failure. (As Spielberg and his notoriously malfunctioning Jaws shark can attest.) Naturally, some film effects don’t stand the test of time. The steak scene in Poltergeist could be much scarier with modern visuals, but the remake does little to improve upon it. Often, attempts to update practical effects with digital ones are too drastic, forgoing any visual middle ground. The computer-generated mutations of the 2011 Thing prequel were well-executed, but they didn’t live up to Rob Bottin’s gruesome ’80s creatures. Neither did the torture-gory visuals in the 2013 Evil Dead remake, even though it was made with the original creators’ participation. These era-specific visual qualities are embedded not just in the effects of classic horror films, but sometimes in their cinematography. The Texas Chainsaw Massacre and The Last House On The Left benefited from their low-budget exploitation-flick aesthetic. But the grimy, voyeuristic 1970s sheen is gone in the films’ reboots and remakes. 1973’s Don’t Look Now, which is in line for a remake, has nothing worth translating from that movie’s plot into a new film, because the movie gets its most heart-racing moments from the way Nicolas Roeg builds tension in the film’s rapid-fire editing and jarringly ambiguous surrealism. What’s the point of remaking a horror film when the actual horror only exists in the film’s original form? Sometimes remakes do work, when a strong sensibility is guiding them. Alexandre Aja’s The Hills Have Eyes remake retained the original film’s horrific violence and mutations. Rob Zombie’s gritty Halloween remake stands up as a terrifying movie on its own, in part by delving deeper into Michael Myers’ history. And sometimes, a remake is so close to the original that it’s neither embarrassing by contrast with the original, nor inventive enough to justify itself, such as the extremely literal 1990 remake of Night Of The Living Dead. When horror films with excellent cinematography, editing, and effects get remade, the original film only stands to suffer. The minute a studio remakes a visually important horror film, it also carves a hole in the new iteration, where the original’s compelling aesthetic qualities once existed. The new Poltergeist is all hole. If the goal of horror remakes is to rake in the cash, so be it. But presumably the goal should be to revive classics, and reinvent them in modern, artful ways that stand up to the originals. And in that capacity, most remakes fail.